The gîtes of "the Grand Buis" domain are quite near a number of interesting places. The duchy of Uzès and its castle, its quaint medieval lanes, its famed "Place aux Herbes" where a colourful market takes place every Saturday. 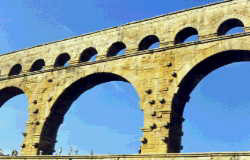 The"Pont du Gard", a famous ancient three-tiered Roman bridge stands nearby, across the Gard river. All along the Céze river, natural treasures lie hidden. Perched villages are well worth discovering such as Montclus, La Roque sur Cèze, Goudargues, Cornillon. So are the Sautadet waterfalls and the Carthusian monaster of Valbonne. In the Barjac and Ardèche regions, you'll find well-known caves, such as the "Aven d'Orgnac", or "la Cocalière". The villages of the "Vans" and "Banne" are worth visiting, so is the famous "Païolive Wood". Canoeing down the Ardèche River gorge is quite exciting, so is browsing among the antiques in Barjac second-hand displays.